"The new XF Sportbrake is said to retain the sporty set-up of its saloon-bodied sibling"
"The 3.0-litre V6 diesel can cover 0-60mph in 6.1sec yet returns 49.6mpg"
Jaguar is pitching its new XF Sportbrake directly at the BMW 5 Series Touring, the current best driver’s car in the class. The British manufacturer says it has imbued the estate with the same level of driver engagement as its saloon sibling, albeit with additional luggage space. The new estate is powered by a choice of three engines, all of which are shared with the XF saloon. The car is offered with either a six-speed manual or eight-speed automatic transmission, and in either rear or four-wheel-drive form. The four-wheel drive system is said to respond more quickly than previous set-ups. From its default rear-biased setting, it can send torque to the front axle in 250 milliseconds when it senses more grip is required. At the base of the engine range is a turbocharged 2.0-litre diesel that produces 161bhp and returns claimed combined fuel economy of 62.8mpg. It drives the XF Sportbrake’s rear wheels and is only available with the manual gearbox. This model is the cheapest to tax — it emits a claimed 118g/km of CO2 — and the most affordable on offer at a starting price of £34,910. However, the variant above it, a 178bhp version of the same 2.0 unit, is predicted to be the biggest seller in the range. It is offered with either rear or all-wheel drive. Completing the four-cylinder range are a 237bhp 2.0-litre diesel and a 247bhp 2.0-litre petrol. The line-up is topped by a 3.0-litre V6 diesel that can sprint from 0-60mph in 6.1sec time but also returns combined fuel economy of 49.6mpg. It comes only with rear-wheel drive and the eight-speed automatic transmission. This is expected to be a strong seller in the UK due to its towing ability, partly thanks to its 516lb ft.
Other markets will also offer Jaguar’s 375bhp turbocharged V6 petrol engine as a rangetopper, but this variant isn’t planned for launch in the UK. Nevertheless, deputy vehicle programme director Alan Hill told Autocar that "the engine could easily be added" to the line-up, should British demand be strong enough to justify it. The XF Sportbrake weighs 1660kg in its lightest guise and is said to have a near 50/50 weight distribution. The car is built on Jaguar’s lightweight aluminiumintensive architecture and has been given different chassis set-up from the saloon. Despite the different settings, Hill said the model is retains the sporty setup of its sibling. Both cars feature a stiff double-wishbone front suspension that uses lightweight aluminium components. The XF Sportbrake has air springs at the rear in place of the saloon’s standard steel coils to enhance its load-lugging capability. The air springs have been designed to keep the body composed even when carrying loads and are claimed to be most effective when combined with optional adaptive dampers. The system is mounted to the same integral rear link set-up as the XF saloon. The new estate comes with Jaguar’s Configurable Dynamics package as an option on automatic cars. This enables drivers to adjust the steering weight, throttle mapping and gearshift modes. Ride quality can also be altered on cars with adaptive damping. Among the list of driver assist features is adaptive cruise control, blindspot monitoring and reverse traffic detection technology, as well as park assist. There’s also a driver monitoring system that can trigger alerts if the car wanders across lanes, or if the driver shows signs of fatigue. Jaguar's All Surface Progress Control system is included in all-wheel drive automatic cars and enables drivers to hand power over to the car in low grip scenarios, so it can juggle torque to each wheel automatically and therefore reduce the chances of the car getting stuck. 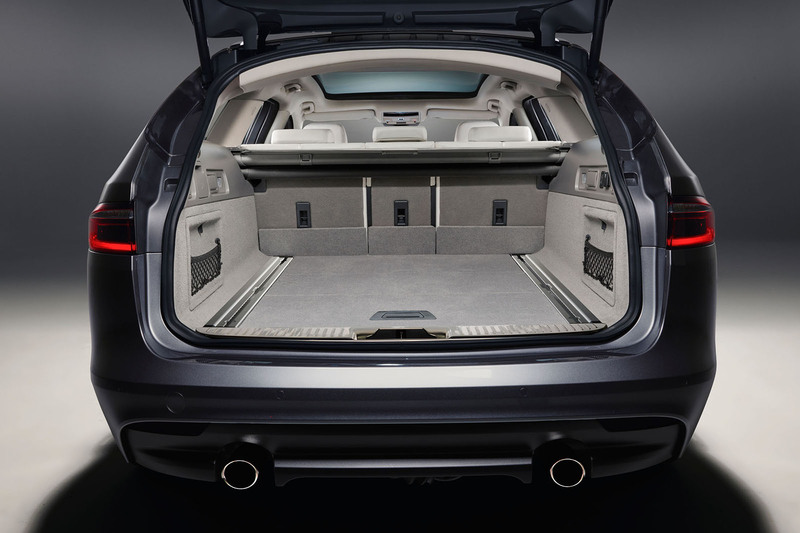 The new XF Sportbrake has 565 litres of boot space with the rear seats up and 1700 litres with them down. That beats the XF saloon by 25 litres and 815 litres respectively and is close to its key rival, the 5 Series Touring. The XF Sportbrake’s rear seats come as standard with a 40/20/40 split and the rear audio speakers have been moved from the parcel shelf (where they’re located in the saloon) to the rooflining to further increase load space. The XF Sportbrake can also carry up to 100kg on its roof, thanks to a 320-litre luggage box that’s on the new car’s options list. Jaguar claims the new XF Sportbrake can tow up to two tonnes, which is 400kg more than the XF saloon and F-Pace SUV can manage. Even the lowest-powered Sportbrake can pull 1900kg. Jaguar’s new estate is 6mm shorter than the previous XF Sportbrake, but its wheelbase is 51mm longer, an alteration that is claimed to improve interior room and enhance the car’s ride. Jaguar says its new estate model has an identical drag coefficient to the saloon, at 0.29. The XF Sportbrake has an estate shape that, unlike the first-generation Sportbrake, was part of the design plan from the new XF’s very beginning. Jaguar design director Ian Callum said this early integration into the XF model plan enabled the team to create an exterior design that’s actually sportier than the saloon’s. The car’s rear does away with the curvaceous design of its predecessor for a more aggressive look. It features Jaguar’s most recent style of slim tail-lights, ensuring the XF Sportbrake is in line with the F-Type sports car and the F-Pace SUV. Above the rear lights, the rear window line is heavily raked like the firstgeneration Sportbrake’s, but it finishes more abruptly at a continuous line that runs around from the side of the car and extends all the way to the front wheel arches. The front of the car is familiar from the XF saloon, as is the cabin, but the Sportbrake introduces a panoramic roof to the XF range. It also has a gesture control feature for the tailgate, which can be opened when a foot is waved under the rear of the car and the car’s key is within close range. The same action can be used to close the tailgate as well, making the whole process hands-free. In order to prevent the automatically rising tailgate from hitting low ceilings in car parks and sheltered areas, a maximum opening height can be pre-set. The XF Sportbrake features Jaguar’s InControl infotainment system, which is operated via a centre consolemounted 10in touchscreen. The set-up features dual-view technology so passengers can see a different display from the driver. The car is also available with the Activity Key, which is worn on the driver’s wrist and negates the need for a conventional key to be carried. Jaguar has given its estate’s new cabin air purification technology that prevents pollution and outside odours from penetrating the cabin. It also features e-ion air purification that can remove bacteria from the air. Order books for the new XF Sportbrake are open now and prices start from £34,910. That’s £2610 more than the base XF saloon, but undercuts the 5 Series Touring by £3475. 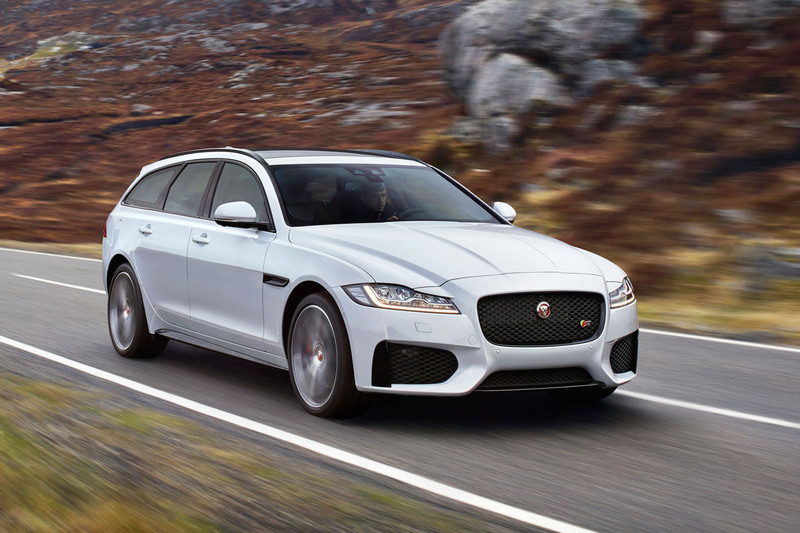 Jaguar will launch the XF Sportbrake into the US market for the first time. It will be the last new variant of the current XF, with no coupé or other bodystyles planned. Is Jaguar Land Rover looking to an all-electric future? I have been waiting for this car but it still does not offer what I want in the UK - 4WD and 300PS petrol or 375PS petrol please. Both engines are available so please offer at least one of them. I don't want diesel and 250PS is not enough for a large 4WD petrol estate. According to the press release only one petrol will be available at launch on the Sportbrake, the 250hp 2.0l already in the XE. Maybe they're waiting for the new inline 6s? Stunning! This is easily the best, classiest and most desirable looking estate car in the class. This makes the staid 5 Series, A6 and E Class estates look even more dull and undesirable, especially the latter which looks frumpy. A shame though that Jaguar won't do a coupe version to really stick it to the E Class Coupe. A XF coupe would look sublime. Until you lift up its skirts and start prodding around. Then you get to see the ho-hum Brummie 'that'll do' quality. Shame. Because Ian Callum and his design crew deserve manufacturing & material quality commensurate with their world-class styling. Considering most of these car have parts made from the same suppliers nowadays, I don't think you will find much "that'll do" here. Those days your talking about was the 60s/70s when car makers made all the parts that went into a car. Nowadays it mainly the engine, car design/development and fit and finish standards that are done by the makers. The only problem with Jags now are their material quality of the interior which could do with a higher grade. Mind you Jag isn't currently being investigated for cheating the emissions test like 2 of the big 3. Good looking. Losing the black panel on the d pillar is a step forward although the rear lights are now slightly too deep and look clumsy as a result. But the real shame is that the Ingenium engines are so lamentable. JLR is saddled with an uncompetitive drivetrain across core areas of the market. Looks good and about time, if designed from the start why does it take so long after saloon is released though? And are the rear lights really slim? They look pretty deep to me. One of these with a petrol turbo please.